Hunter Walk knows what it takes to scale a world-renowned product. During his tenure as Director of Product Management at YouTube, he increased traffic by 40x while growing his product team from three to more than 30. Today Hunter is instilling the lessons learned with promising young founders through his seed-stage venture capital firm, Homebrew. He’s a must-follow for entrepreneurs on Twitter, and he regularly shares startup advice at hunterwalk.com. I caught up with Hunter to get his take on what it takes to excel in product management, why growing companies must prioritize bigger bets over easy, low-effort improvements, how he identifies his seed investments, and more. Exceptional product managers share four common skills: curiosity, communication, service leadership, and empathy. 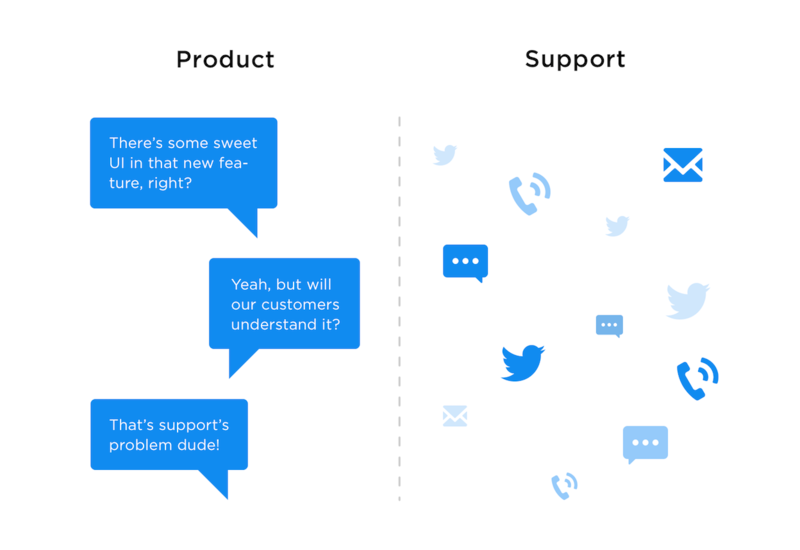 When product management and customer support don’t have a bi-directional line of communication, the product suffers. If leadership isn’t helping your organization understand why a big, transformative bet is important, and working on one of those, your company’s growth curve is likely flattening. For founders to garner a seed-stage investment from Homebrew, Hunter needs to see a product solving a problem that is large, urgent, and valuable. The best founders are intentional about culture, hiring practices, fundraising velocity, org structure, etc, because they’re building a company they want to work at for a very long time. Adam Risman: Hunter, welcome to the show. Can you give us a feel for your career trajectory and what drew you from working on products specifically into the world of venture capital? Hunter Walk: We’re about three and a half years into Homebrew. Before that I spent a lot of my time on the product side; it was actually the place where I found that left brain and right brain worked together. I spent three years at Second Life and then nine years at Google, divided between AdSense and YouTube. The connective tissue between Second Life, AdSense and YouTube was technology as a tool of creation within a community and audience, and then importantly, with an economic model that would allow creators to see dollars from their creations, not just likes and hearts. Adam: During your run at YouTube you were the director of product management and over that time, you grew traffic by 40x. What were the biggest challenges you faced in that time? Hunter: I came over from Google right after the acquisition and although it’s funny to think about now, the acquisition wasn’t necessarily embraced by the tech community. Everyone thought Google overpaid, this was a site that was just about dogs riding skateboards, how was it ever going to make money, was it legal, was it just a fad? It was about 65 people, Google let us operate separately, still headquartered in San Bruno, so we weren’t even on the main Google campus. From a product standpoint, I was lucky enough to inherit something that was burning hot, but how could we turn phosphorous into a furnace? How could we make sure that it burned forever? There were three main things that I set out to accomplish during my time at YouTube. The first was taking it from phenomena to ongoing consumer product. Can we make sure that it grows with our users and grows across platforms? Second, could it make any money? Eventually you have to figure out how to not just pay Google but, more importantly, pay the creators who are putting video on the site. Then there were some lawsuits at the time. There were people who were attempting to say that YouTube was benefiting improperly from copyrighted works. We always wanted to work very closely with rights owners, so started very early on we asked, how do we build the tools to make fan uploads productive as opposed to destructive? Adam: While juggling all these product concerns, you also grew the product team from just three to more than 30. A lot of our listeners are from small, early-stage companies and they’re just now starting to look to hire and grow their product teams. What traits do you often see for those that are going to excel in product management? Being consensus-driven is death from a product management standpoint. Hunter: Regardless of the nature of product management and the nature of the product, you need four qualities. One is curiosity. You have to always be asking questions and always wanting to learn. You have to be a good communicator, you’re going to be talking not just to engineers and designers but cross-functionally across the entire company. You’re often an external-facing champion of your product as well. Third, you need to be working in service of something greater than you. Product management is about service leadership. It’s about realizing that you’re there for a period of time to take a product from one stage to another. People sometimes say, “You’re the CEO of the product.” I think that’s fine, so long as you realize that what you’re doing is trying to make something stronger, to then potentially hand off to the next set of leaders to take it beyond your time. Then you also need to have empathy and customer focus. You have to be able to put yourself in the shoes of others and understand their points of view. That doesn’t mean you have to be consensus-driven; in fact, I think being consensus-driven is death from a product management standpoint, but you do have to understand other points of view, even if you don’t always agree or act upon them. Adam: You’re getting feature requests from all sorts of different avenues too. You need the backbone to really be able to say no to most of those, right? Hunter: Absolutely. People need to feel like they have the opportunity to comment, to criticize, to provide their suggestions, but at the end of the day, whether it’s you, one of the product managers in your group or somebody else within the company, you need to have clear decision makers. When the comment period is done, you have to trust those people to make the right decisions. Adam: You’re a product manager from a non-technical background. For PMs that have had a similar path, how should they go about prioritizing or seeking guidance when it comes to things like infrastructure work or engineering challenges? You obviously don’t want to fake knowledge that isn’t there. Hunter: There were plenty of times in my career where I felt like an impostor, especially at Google. To the right and to the left of you is a product manager with a technical background and they keep talking about how those are the product managers they want to hire. However, I noticed that most of the product VPs didn’t have technical backgrounds. I had plenty of role models within the company that could prove you didn’t need a technical background, despite the fact that I was being told that every 23-year-old with a human computer interaction degree from Stanford was a better PM than I was going to be. There are certain types of projects that require certain backgrounds. If you’re a PM who lacks deep technical knowledge, there’s some infrastructure stuff that probably doesn’t make sense. I would say almost everything else does. You need to be technically curious and technically confident if not necessarily technically trained. It means developing great rapport with your engineering counterparts, it means trust, it means understanding what questions to ask to get the data you need or to help people think through making the right decision. Product management is about service leadership. I worked for Susan Wojcicki – Google was famously founded in her garage and now she’s the CEO of YouTube. When she brought me into her product org, I leaned over and I was like, “I’m nervous, I don’t have a CS degree”, and she said, “Hunter, we have lots of really great engineers. If you had to make technical decisions, Google would be in a lot of trouble. It would mean that we were hiring bad engineers”, and that gave me a framework to think about this. My job was to help our really great engineers and our really great engineering leaders aim their talents in the right direction. I relied upon my ability to help create that direction, my ability to make sure that direction stayed on track and my ability to help those people feel great and proud about the work they were doing. I don’t think any of that requires a technical degree. I’m not clear that any of that even requires a college degree, although I’ll push for the liberal arts since I was a history major. Adam: One of the big collaborative points for us with product is customer support. We’re actually embedding customer support team members with the product team to make sure the customer’s voice is heard. How did your product team, whether it was at YouTube or Second Life, work across disciplines and how crucial was that to your success? Hunter: Incredibly important at every company I’ve been at. At YouTube, you had a very large and very vocal community, and there were things they often needed help with. Sometimes that was purely technical help, sometimes that was enforcing community standards. Very often it was as we rolled out new types of features or rolled out to new countries. It was also an education for us. The only way that we’re able to let information flow from the company to our users and from our users back to our company, was thinking about support as a bi-directional channel and not just as an FAQ or a call center. If product and support teams are siloed, you won’t build what your customers need. We embraced having a product manager who worked closely with that team, figuring out what KPIs we wanted to measure for support, that weren’t just about triage and dismissing, but were more about, do we have a high NPS in our interactions with our users? Are we gaining information and insights from our support channel just like we would from user research or market research? We looked at all of those interactions as opportunities to learn rather than potential issues to just smother. Adam: Despite all of the success that you had scaling the product and your product management team, you’ve said you weren’t necessarily the best product leader. On paper it looks like you were outstanding. Is a result of the politics involved with management and being a step removed from the creative decision making? Hunter: I’m very proud of the accomplishments that occurred while I was there and credit an amazing cross-functional team that I had the chance to work with. I do think that there were two distinct periods in YouTube’s development that I had the chance to play a role in. In the first half, I would give myself very high marks; it was growing the initial team, it was working under the guidance of Chad Hurley, the CEO and one of the founders, and it was YouTube truly as a separate entity. That was when we did a deal with Apple to get YouTube as the only third-party app on the initial iPhone. We papered agreements with Twitter and Facebook, we were really externally-focused and meeting our users where they were and thinking about how to move quickly, be innovative and take risks. We reached a point in size where, all of a sudden, we became strategically important to Google. We had a change in leadership, we had a great leader from Google come over as Chad moved into more of an emeritus role, and a lot of the discussion at that point became about where YouTube fit into the Google portfolio. We reached a scale in headcount where, as a product leader, I felt like my job needed to switch towards people management and clearing roadblocks for them opposed to being on a whiteboard or helping them think through product design decisions. Those were the areas where I found myself to be less satisfied and maybe not living up to the expectations that I had set for myself. Some of that you can call politics, but I don’t want to be pejorative. Those are important skills for product management leaders to have and my successor was great at all of those things and exactly the right leader for pulling YouTube into that next phase and continuing to increase YouTube’s reach and profit and everything by another order of magnitude. I went in strong, I’m proud of what we accomplished, but I also realized towards the end that it was possible to get pulled into a role that didn’t necessarily suit me. That’s where it comes back to that service mentality. Am I working in service of myself, or am I working in service of the product, the company and the team? If it’s the latter, which is what it should be, then you start to realize that you’re not exactly what they need at that time. It took me a little while to realize that, but in retrospect, stepping away and leaving was the right decision. Adam: At any technology company one of the biggest challenges is prioritization. Recently you had a chat with our senior director of growth, Ben McRedmond, about prioritizing work in a way that creates impactful change. You’ve got a chart with effort across the X axis and impact spread across the Y axis. Most everyone is pretty good about avoiding the high effort, low impact work. 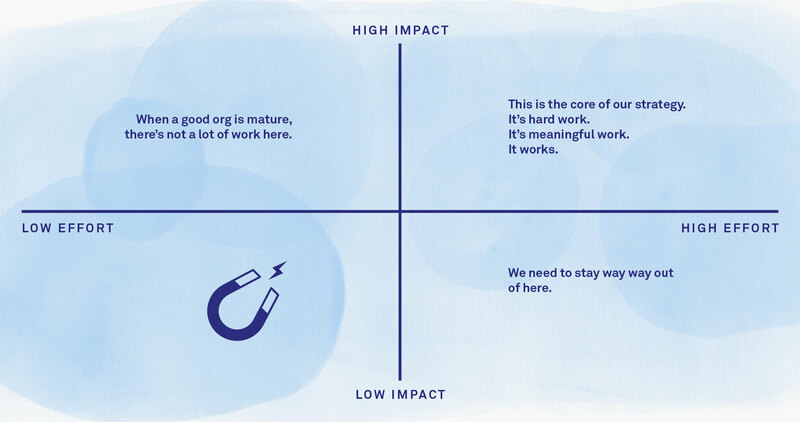 When it comes to high impact, low effort work, there’s really not much there once you’re a mature company. Then you’ve got the low effort, low impact work and you’ve called that snacking. To me that’s copycat features, that low-hanging fruit, maybe changing a button color or small language tweaks and UI, etc. Why do startups feel pulled towards this and what’s the risk there? Hunter: As an individual atomic unit, any one of those changes is valuable, right? It’s not that the reward isn’t there. They each have a positive benefit, but they’re all small, local optimizations. They all avoid the big bet you should be making, the more complex question you should be asking yourself, such as are we growing more relevant or less relevant as a product for our users? Is the world around us changing and do we need to be aggressive in changing with it or leading our users to a new reality? A little snack here and there never hurt anybody, but trying to do nothing but eat potato chips all day will eventually leave you dead. If you have an organization that doesn’t want to take risks or where failure to deliver results – even though it was a smart, calculated bet – is punished right away as opposed to examined and improved, then if given the choice between something that you know is going to have a minor improvement and something that is going to take a longer time to prove, the gravitational pull will be towards those small things. In fact, a lot of wonderful software tools, the multivariate testing frameworks, are often geared towards finding the beautiful snacks. The one that is most insidious and sometimes the hardest to fix is when you have lots of talented people who are doing nothing but snacking, nothing but items three through twenty on their to-do list as opposed to items one and two. It can be an indication of dysfunction as opposed to highly functional, and that’s to say there is a decision that’s not being made, there are groups that don’t want to collaborate, there are people who just get frustrated – the designer or the engineer who doesn’t want to sit at another meeting to debate the outcome of a big effort. As a leader, if you’re not helping your organization understand why a big, transformative bet is important and always working on one of those, preparing to work on one of those or coming out of working on one of those, then your growth curve is likely flattening in some way. You’re losing the chance to pull ahead of the competition, to pull your users into the future. The graph may not show it yet but you wake up each day and you haven’t made progress towards reinventing yourself. Adam: Is part of that the lure of chasing the competition rather than trying to make that high strategy big bet? Hunter: It can be. If you miss a platform shift, it can be very hard to catch up. As a leader, trying to make the decision of whether we should catch up or whether we should try to leap frog is a really tough one. If you go into any company and ask do you think we’re becoming more relevant or less relevant to our users every day, you’ll get some really interesting answers. You can also tell when people are trying to change the KPIs on you. Changing the KPIs can be one of the most effective ways to actually make a phase change to burn the ships, but you can also tell if you ask what the motivation was. It’s the classic MySpace example. I remember when MySpace shifted from focus on its US user base to global user base. It was because growth was stopping in the US and you had all these other countries where growth was going wonderful, so you want to find the next chart that shows you’re up and to the right. What they should’ve been asking was, “Oh no, what’s going on here in the US?” Why is this flat lining? Is that indicative of what’s going to happen in other markets once we meet maturity or once Facebook rolls out in those geographies? One of the most brilliant things my successor at YouTube, Shashir Morocho, did was (look at the) lethargy setting in and around view counts. It was no longer the best way to understand user engagement, and there was a big party when we hit one-billion view counts. It became trying to get people excited about hitting two billion, three billion, four billion. It was numbing. There was no galvanizing, user-facing stat. He led this organization-wide change to move from view count to amount of video viewed per day. It all of a sudden became about longer sessions. How do we get from 15 minutes a day to 30 minutes or 60 minutes a day? That required a leap of faith and rethinking our analytical frameworks, but ultimately it reframed what a happy, successful user looked like in a way that ensured that the YouTube of mobile, the YouTube of the living room, and the YouTube of today is YouTube and not a successive property. If I had stayed on, I don’t know if I would’ve been able to make that change.I had grown up in this view count environment. I inherited the product when it was at 100 million views and I’d taken it to four, four and a half billion. I wanted to get to 10 billion, but that wasn’t the right metric for that product anymore. Adam: You’re now at Homebrew, your VC firm that’s focused on the seed stage – essentially a startup funding startups. What was it about that stage specifically that you were excited about or in favor of rather than something more advanced like a series A? Is it the ability to roll up your sleeves and be able to collaborate with founders, harkening back to your product days? Hunter: Hombrew began because my co-founder, Satya Patel, and I wanted to work together again. We’d spent a few years working at Google and his background is a mix of product leadership roles and venture. He had led product at Twitter prior to us starting Homebrew. Venture, and specifically seed stage, wasn’t where we started. We didn’t start with an idea of what we would do together. We talked about what would it mean to work together again and used that to narrow down what we would enjoy doing together and where we could add something to the community. We were really focused on how do we want to spend our days, what sort of a relationship do we want to have with founders and how do we want to make our money? What does success look like? We asked ourselves those questions as opposed to, “How much can we raise? Okay, that’ll be the fund we are”, or “What’s the most near-term, economically-advantaged strategy for us to take,” which is certainly not being a seed fund. It came down to, do we want to create value for ourselves on the term sheets, do we want to be thinking about an 80-page document with all these different conditions for what could or might happen, do we want to make our money with an Excel model, plugging in data and trying to figure out if this company’s going to IPO in a year or not? The answer to all those things is, of course, no. We want to be good at identifying founders who have a strong vision for what the future should look like, a future that we believe in, a future that is solving a problem that’s large, urgent and valuable. Then, somebody who can put sweat and reputation behind every day. You make an investment decision, then you still have to get up with that team every day. That’s why we focus on seed. In my experience with YouTube and the other companies I worked at, the first few years of the company’s existence was the time I had the most fun. While we’re not on the org chart, we don’t think of ourselves as player-coaches. We’re investors. Being an investor at the seed stage does have a slightly different playbook than being an investor at the A, B or C stage. We picked the segment of company where we felt like our values were most aligned with founders and the way we want to spend our time was well connected to how we would create value, which was to help these companies get further along. Adam: When you and Satya talk about the way that you work with the companies you invest in, you describe yourselves as partners in conviction. What does that mean in practice? Hunter: When we started out, it was really this question of, what would it mean to be the type of investor we would’ve wanted to take money from? Sometimes investors get this knock which is, “You don’t care about any one company because you’re invested in 10, 20, 30, 40 companies. No one matters that much to you.” Of course, when one company’s doing great, you want to get out there and tweet about it and run to the head of the parade, but you’ll never care about any one company. While as investors it would be foolish to invest in only one company per fund, we wanted to concentrate our time and concentrate our dollars. We make about eight to 10 investments a year and we’re usually playing a leadership role in that seed fund raise, we’re writing the largest check into the round. For us, conviction is about two things. It’s about how we spend our time – we spend about 40 to 50 percent of our time with the current investments. We go in asking ourselves the question not just, “Do we think this is a good investment?” but do we want to put sweat and reputation behind this team’s vision of what the future should look like? Because if we can’t say that, it’s not their problem, it’s our problem. The founders are certainly getting up every day and putting 100 percent of their sweat and reputation behind their vision of the future and how they want to get there. For us, it’s that last gut check that says, “If we can’t go into this with that same conviction, then the founders deserve better investors.” During these earliest days you’re pushing a boulder up a hill, and it does no good if you have investors who are sitting on that boulder or even worse pushing from the other side. We’ve got to get our hands on that boulder with the founders with their team. Adam: If a founder is looking to raise seed funding from you or Homebrew, what are you really evaluating at this stage? In series A stage, momentum is looked at quite heavily. In raising a series B, it’s metrics. Walk me through your seed evaluation process. Hunter: Every company is a snowflake, so at the end of the day, based upon what vertical they’re in, what they think their business is, there’s certain different things you want to understand. Three simple things are universal for us: Do we think the company is building a product or service that solves a problem that is large, urgent and valuable. Problem size is our proxy for market size. For us, problem size is our proxy for market size because any entrepreneur can come up with a slide that says, “This is a seven-trillion dollar market”. What we really want to know is, what problem are you trying to solve, and is that problem large, urgent and valuable to your potential user? Large, is it big, are there a lot of people who are impacted by this? Urgent, if you provide them a better product, a better service, are they going to want to purchase it, does it matter to them right now? Valuable, can you capture a percentage of the value that you’re creating for them? If you only have one of the three, I’m not sure you have any type of business. If you have two of the three, you can still build a very successful business; it’s unclear to me whether it can be a venture scale business, which isn’t pejorative. Venture is only one particular type of financing and it’s actually not a great type of financing for a lot of very successful businesses. If you have all three, then all of a sudden you start to see, “Now I know why they need to raise money, to spend money ahead of revenue, to spend money to push growth, to spend money to hire a team before they know whether or not everything is going to work”, as opposed to incrementally growing. Then it comes down to whether the founding team has not just the aptitude but the attitude to solve this problem fully. Most of these large, urgent and valuable problems are going to take 10 years to solve. Even though a seed round might be 12-24 months of capital and you’re trying to find product market fit, you’re trying to figure out how to prove that next round of investors. You should be going into raising your seed round assuming that you’re going to be working on this problem for ten years if successful, and if that scares you, step back before you raise capital, because you’re getting onto a path that really means the best case scenario is you’re going to be working very long and very hard on this problem, with these people. When I say with these people, not just your founders and your team, but the investors you’re bringing on board. Adam: You said that if your first product is indeed your company then building the actual company itself should be a top priority. Do you frequently see early-stage founders stuck in a sprint mindset? What foundational areas are necessary to shift toward a more company-level outlook? Hunter: If you start out believing this company’s going to exist for a long time, you have a very different point of view. We’re investors in a company called Honor. The CEO, Seth Sternberg, who previously had a very successful outcome building a company called Meebo that he sold to Google, when he started Honor, that’s in the home healthcare space, he started thinking of it as a 20-year company and combining a sense of urgency with an endurance, knowing how long it would take to truly change his industry. They just raised a $42 million B round, so he knows it’s going to take a lot of capital to do it, but he’s strapped in a very long period of time. I urge founders to be intentional about the choices they make. Your product isn’t going to be five separate teams all working on features without talking to anybody else and then trying to ship those features and say, “Now we have a product”. There’s very little chance that that would work, let alone whole be greater than the sum of its parts. As you’re thinking about your company, you’re thinking about your culture, hiring practices, fundraising velocity, org structure, etc. Sometimes people are tempted to think of those as disconnected decisions, but they’re all connected. Then you ask, “If somebody is incredibly skilled but doesn’t have these attributes, would you hire them?” If the answer is yes, then you have a culture that’s going to be a patchwork; if the answer is no, these are the values that you want your company to embody, you have a culture. That takes place without having to write a mission statement or putting a bunch of flowery language, embroidered into something you hang in the office. The people you hire and how you think about them – not just as culture fits but culture adds – thinking about diversity early on so that you don’t accrue cultural debt in addition to technical debt, all those things go into being intentional about what you’re building. They don’t go into overbuilding, they don’t talk about slowing down, finding product market fit so that you can work on being a great company. The best founders are intentional about the company that they’re building, because they’re building a company that they want to work at for a very long time. Adam: Sounds like Homebrew in a lot of ways. Hunter: In my mind, we’re in year three of a 20-year roadmap. Adam: Hunter Walk, thanks so much for joining us. We’ll leave it there.